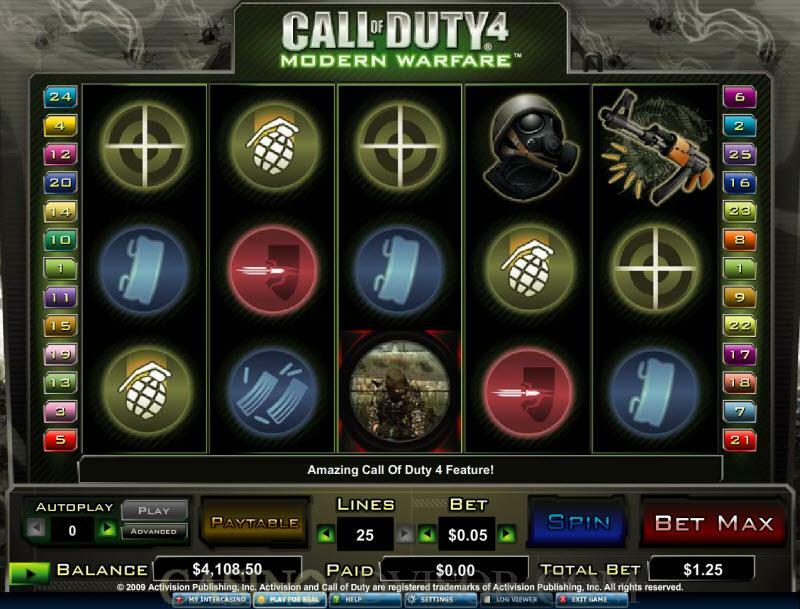 Call of Duty 4 is a video slot from Cryptologic. It has 5 reels, 25 paylines and a maximum bet of 25 coins. The slot is based on the video game of the same name that has been released by Activision. In this version 4 the scene is modern warfare. The Standing Soldier is the wild symbol. The Call of Duty 4 logo is the scatter symbol, which triggers the bonus game on the second screen. The other symbols on the reels are elements used in modern warfare. They are Kneeling Soldier, Machine Gun, Gas Mask, Grenade, Grenade Logo, Cross Hair Logo and logos of other combat elements. Before starting the game players will have to choose the coin denomination by operating the arrows on either side of the coin denomination button. Coin denominations show an amazing degree of flexibility. There are 11 options between 0.01 and 1.00 and then the denominations increase in increments of 1.00 till 10.00. Players will also have to enable up to twenty-five paylines. The paylines can be activated by operating the arrows on either side of the LINES button. Winning combinations pay only if they occur in enabled paylines. 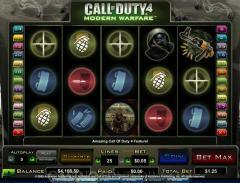 In Call of Duty 4 players can wager only one coin per payline by default. But this is hardly a problem because the coin denomination range is suitably larger. Once the settings have been completed the game can be started by clicking the SPIN button. The Standing Soldier is the wild symbol. It doubles payouts when it substitutes to make a winning combination and offers a fixed jackpot of 5000 coins when five symbols appear in an enabled payline. Two or more scatter symbols result in scatter payouts. Five scatter symbols have a payout of 200 coins. An unusual feature is the exploding symbol. Randomly an explosion takes place on the screen with a shattering sound jarring the reels. Then one or more of the symbols are arbitrarily converted to wild symbols. Three or more scatter symbols trigger the bonus feature on the second screen, which replicates the video game. Players have to shoot down enemy soldiers. 4 free spins are awarded for every soldier hit with a bonus prize for headshots. Bonuses are awarded for hitting cars and barrels. A five in a row killing streak leads to an air strike in which players can win multipliers for the free spins. If the players fail in the air strike they are given a default multiplier of 2. 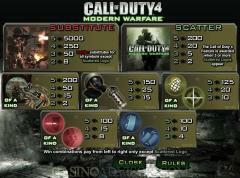 Interested in reading more detailed information about Call of Duty 4? If so Click Here for more details.